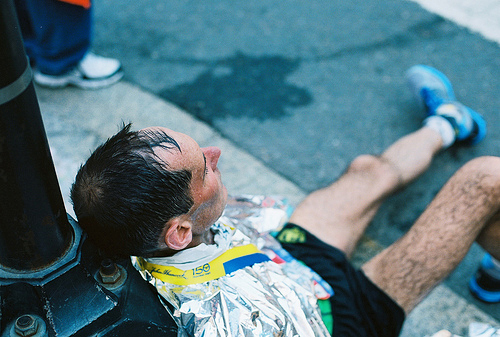 If climate heats up, will Boston Marathon slow down? BOSTON U. (US) — Future winning times in the Boston Marathon may slow as the climate continues to warm, experts say. Running times are already affected by weather on the day of the race. “We found that warmer temperatures on the day of the race slow winning times such as occurred in last year’s hot weather when the winning men’s time was nine minutes slower than it had been in the cool-weather race of 2011,” states study co-author Richard Primack, a professor at Boston University. The study, published the open-access journal PLOS ONE, demonstrates that winning times are almost 2 minutes slower for every 10 degrees F increase in temperature. The main reason that heat so often beats runners is its adverse effects on the human body’s ability to regulate internal temperature, leading to heat exhaustion, cramps, dehydration, and other injuries. Since 1924, winning times for the Boston Marathon have grown steadily faster as training methods have improved and an increasing number of international runners have participated. The finding that racers run slower in hot weather is neither surprising nor new. But what about the effects of global warming? Are they slowing race times in Boston? Boston’s average annual temperatures have steadily warmed since the Boston Marathon started being run eighty years ago. Even so, the researchers found that the average temperature on race day has not changed so far because of the great variation in the weather from day to day in Boston. The temperature for the 2012 race, for example, fell only one degree short of the all-time high at 89 degrees, while in 2011 it was a chilly 57 degrees. As a result, global warming has not yet affected winning times of the Boston Marathon. To predict how race times will change if Boston temperatures continue to warm as predicted and still have their current year-to-year variation (i.e., swings like that between 2011 and 2012), the Boston University team created a computer simulation using past winning times and weather. If temperatures increase by the mid-range estimate of 4.5 degrees F, there is a 64 percent chance that winning times will be slower by 2100. If the shift is as high 9.4 degrees F, which is an upper estimate of global warming, the probability of slower race times is bumped up to 95 percent. “As temperatures warm, it will get increasingly difficult to avoid slower winning times” observes study co-author Nathan Phillips. The results have implications for the future on all warm-weather outdoor activities, including manual work and sports and the fate of endurance running in particular. In 2007, the Boston Marathon start time was shifted from noon to the morning in part to provide cooler conditions for runners. The next few decades will tell whether morning start times will be enough to keep winning times from slowing in a changing climate.